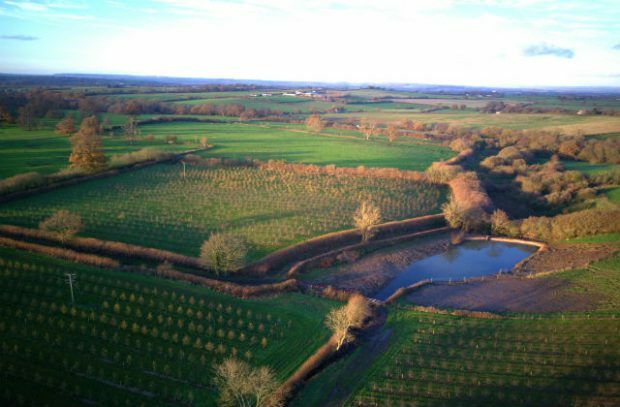 A ground-breaking partnership project involving Natural England has been awarded a prestigious environmental prize for its work to reduce long-term flood risk, in the aftermath of devastating flooding in Somerset during the 2013-14 winter floods. The work of the ‘Hills to Levels’ project, led by the Farming and Wildlife Advisory Group South West, has been recognised with the 2018 River Prize. The project brings together a number of partners to take action to 'slow the flow' to reduce flood risk, reduce erosion, improve water quality, deliver wider environmental benefits and increase resilience on the floodplain. Using natural flood management tools, the project has planted new woodland to help slow the flow of water across the landscape. Creating ‘leaky ponds’ has added space to capture and hold extra water, before releasing it slowly into the land. It is great to get recognition for a project bringing together water quality and water quantity. Using flow path maps and local knowledge from land owners and flood wardens has been crucial to achieving better water and soil management. Hills to Levels has engaged more than 100 farms to take natural flood management action. The Catchment Sensitive Farming programme focuses on giving practical advice and guidance on soil and land management to improve water quality. Since 2006 Catchment Sensitive Farming has made a significant step in improving our rivers through working with farmers and our partners. This award recognises the significant work we’ve done, including more than 1,000 farm visits, with our partners in Somerset and the surrounding area. It’s been a privilege to work with this fantastic team of dedicated people, by sharing expertise and linking up national and local funding streams this collaboration has helped develop and implement Natural Flood Management across the catchment. I look forward to ongoing success and inspiration for the future.